Create a lasting impression for your business with customizable Print-On Dividers. Perfect for client proposals, service menus or presentations, they're three-hole punched and ready to use. They're also great for wedding planners, scrapbooks and recipes. Save time by printing directly on the divider. Add text or graphics to both the divider sheet and tab in one pass through the printer. No labels to apply. Easily create and format high-quality projects in minutes with free online templates and designs. 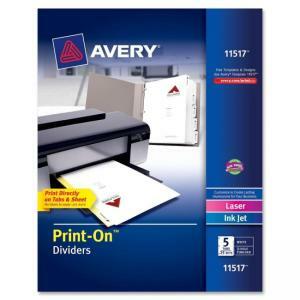 Print-on dividers are compatible with both inkjet and laser printers.